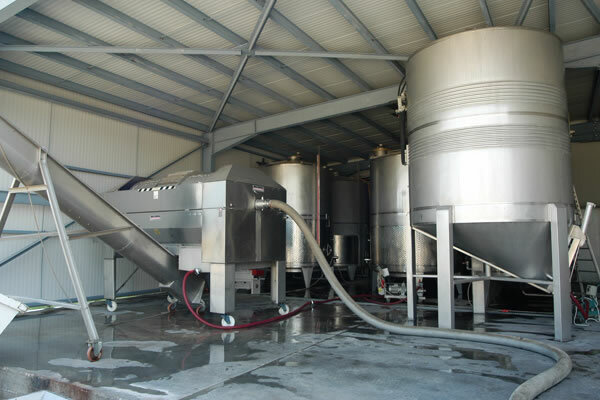 The winemaking facility of our Winery consists of a weigh-bridge, a grape reception area, a pneumatic press, and tanks with cooling jackets for maintaining the must and wine at the correct temperatures before, during and after fermentation. We receive the grapes in baskets, we weigh them, and then each type of grape follows a special process to be vinified. Details on the vinifying procedure for each type of wine can be found by visiting the Wines section of this website. Once the vinification process is complete, the wines are selected either for ageing in oak barrels or directly for bottling, and are conveyed accordingly either to our wine cellar or to our bottling plant. Vinification is one of the most important stages in the entire process of winemaking, of equal importance with the stages of viniculture and harvesting, ageing and bottling, and finally storage and preservation. The precise vinification procedures followed will vary from year to year in order for the maximum possible potential to be drawn out of each grape harvest. Our experience, accumulated over many years of winemaking, together with our expertise in the evolving science of Oenology and our continuous application of new technologies jointly ensure the excellence of the production processes employed at the A. Megapanos Winery.